Last week my Butterfly Lab Little Single (SC) Bitcoin miner finally arrived. The good: it works as advertised and mines Bitcoins at about 30 GH/sec. Setup was a breeze on Windows 8; plug in the miner, install the WinUSB driver using Zadig, startup cgminer, and away it goes. The bad: it runs with all the subtlety of a jet engine. This thing is far and away louder than the eight GPUs I used to have running full-bore minting Bitcoins. Something needed to be done. I took it apart to see if any improvements could be made. Two problems stood out: the heatsink fan was pointing in the wrong direction, and there was no air intake fan. Rummaging in the closest revealed a pair of Corsair 120mm fans and a 3-pin power splitter, so I already had all the hardware I needed. Flipping the heatsink fan around, replacing the stock exhaust fan with a quieter model, and adding an intake fan took about 10 minutes. The noise coming out of the unit is easily half of what it was; using a cheap iPhone sound meter gave a reading of 60 dB (for comparison, the same meter read 55 dB for a pair of mining GPUs). Not only is it quieter—it’s also running cooler. Prior to this mod, it ran at about 80° C. Post-mod, it bounces between 68°–70° C. I’ve noticed that when it gets down to 68º the fans spin down further, to the point where it’s nearly silent. When the temp creeps up to 70º the fans spin back up, but still nowhere near the loudness level of the stock cooling solution. Corsair Air Series SP120 High Performance Edition fan twin-pack (I used stock Corsair fans from an old computer case, I think they sit somewhere between the High Performance edition and the Quiet edition models in terms of both airflow and noise level). Remove the four Torx screws from one end of the unit. Disconnect the exhaust fan from the 3-pin connector (located in the middle of the unit’s mainboard). Remove the four Torx screws from the opposite end of the unit. Remove the two Philips screws from the heatsink fan. Install one of the 120mm fans as an exhaust fan next to the heatsink (replacing the fan BFL supplied). This should be blowing hot air out of the unit. Install the other 120mm fan as an intake fan on the other side of the unit (BFL didn’t include a fan here on my unit). This should be drawing cold air into the unit. 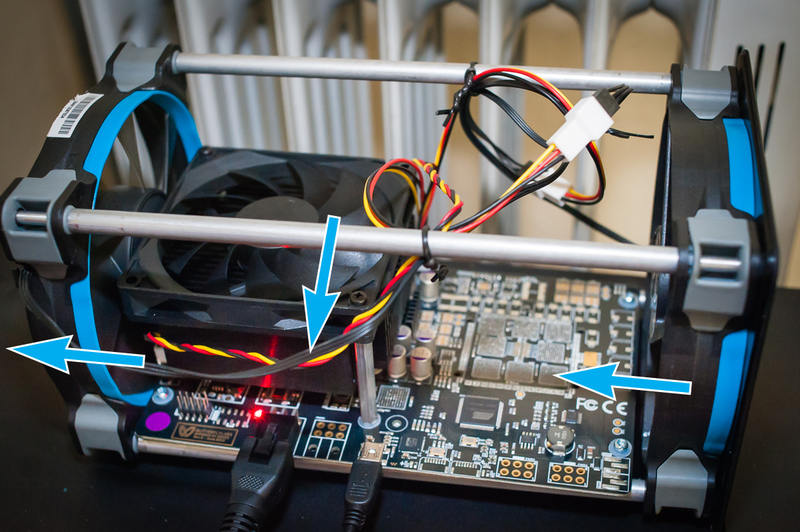 Use the 3-pin Y-splitter to connect both fans to the single 3-pin fan connector on the mainboard. Slide the case back on and screw the end-caps back in place using the Torx screws. Here’s a photo showing what it should look like (with the case removed). The blue arrows indicate the direction of airflow for each fan. Improved airflow on the BFL Little Single. It’s not completely silent, but it’s quiet enough for me to run 24/7 now. Thanks to Butterfly Labs for providing excellent Bitcoin mining hardware; I just wish they’d had put a bit more thought into the unit’s airflow. Thankfully, that’s easy to fix on our own. This entry was posted in Technology and tagged bfl, btc, hardware hack, mod, sc by Todd Kulesza. Bookmark the permalink. Hi, I am following your instruction try to scilence my miner. However I can only remove three of tje four screws. I cannot get the last one off no mater how hard I try… Do you have any suggestions? Thank you! Try re-tightening all four, then slightly loosen each one. Keep slightly loosening them as a set (e.g., one turn of the screwdriver per screw) until they come out. Try holding down the metal pole that sticks into the fan and to which the screws attach. Otherwise, the whole metal rod may start spinning which defeats the purpose. Reversing the heatsink fan to point down resulted in a 4 degree increase in the reported temps. Not sure why, but it seems to work better in the opposite direction. Thanks for the info! I found the opposite result on my rig, but good to know that some experimentation may be needed to find the optimal temperature for each unit. Can you share your temperature stats? I’m having similar issues with increased temperature after flipping the fan, but I’m using 2 of Enermax T.B. Silence, same directions as you. Hovering at around 76 C. Could be just that I need to get better 120mm’s. I didn’t save the exact readings for different fan settings. Right now it’s in a fairly warm room and running at 76 C. The ambient temperature seems to have a strong impact… during winter, I rarely ever saw it break 70 C.
Thanks! Looks like I’m in the normal range. Did you try to run it without the case on and see if it had any impact on the temps? I took my miner out of the shell, flipped heat sink fan and operate it like that. I put a small fan that blows on my units. Quiet and all units bounce from 65-70 C temp. Also get rid of stock PSU. It generates to much heat around miner. Now with the extra fan blowing down and the BFL orginal fan still blowing against the heatsink I got a steady 60 degrees. Without the coolink 64 degrees. I have the big fans in the opposite direction, so 1 big fan blowing to the heatsink, the otherend is blowing air out. Everything back in the original case, except the 2 perforated plates are not added on the sides because these cause more noise. I monitored and with an ambient temp of 21 degrees the miners stays stable at 63/64 degrees. I bought just a 60Ghz Butterfly off eBay to learn more about mining bitcoin. After finally getting it to run the temp was topping out at 90C, and the unit itself was shutting down processing, cooling off and then starting up processing, over and over in just a few minutes of starting to mine. I touched the top of the unit and nearly burnt myself – I exited BFGminer and left the unit running to cool down. Oh the noise it made was similar to small airplane up close. OUCH. While searching for solutions I stumbled on this article. Excellent info!!!! I checked the fans and both fans where pushing air out with no air intake, not good. I opened the unit up and flipped the fans on the heat sinks to push air down, and insured one fan on the end was pushing air in and the other was pulling air out. Before I made this change the unit only ran for 6 minutes before I had to shut it down due to concerns of heat. After the change I have been running this unit for the past 50 minutes (yup I started the timer on my phone thinking it would fail at about 6 minutes again) and the temp has stayed around 70-72C. It still runs load but nothing like before. I have a small oscillation I can hear and will reopen the unit in a few minutes to see if I can fix it. Thank you for this excellent article. Moving forward with learning about bitcoin mining. hey, thx for this post. I just had an intake and exhaust fan on my unit, no fan on the rad. Do solve my overheating problems, I just replaced the crappy thermal pad with a bit of Artic Silver 5. I finally added a 80mm fan on top of the black radiator. Doesn’t make much difference though. I saw some pictures of the BFL with what seems to be an upgraded heatsink with heatpipes. Do you have any info about it ?